It has been hot and humid with rain expected for a couple of days. Yesterday afternoon the rain came with a few bursts of thunder. Lovely big drops of rain. Relief from the humidity at last. I do love taking pictures in the rain, I just need to work out a better way to hold the umbrella when my camera is in two hands. We didn't have rain when London had its storm - but could hear it on Wimbledon! What about a hat with an umbrella fixed to it? I have been out on a few bike rides lately when it has started to rain, and I mean really rain. So hurrah for summer! The smell of rain after a bit of a hot dry spell is absolutely the best, great picture Mo, love rainy day images. I love this photo! I'd love to see this kind of rain happen here! What a relief that would be. Not easy to do. Good luck. It's your turn for rain I guess. Ours just let up and we're having better weather since yesterday. Let's keep our fingers crossed. I was at the PRO in Kew, hell of a hail storm about 11am. 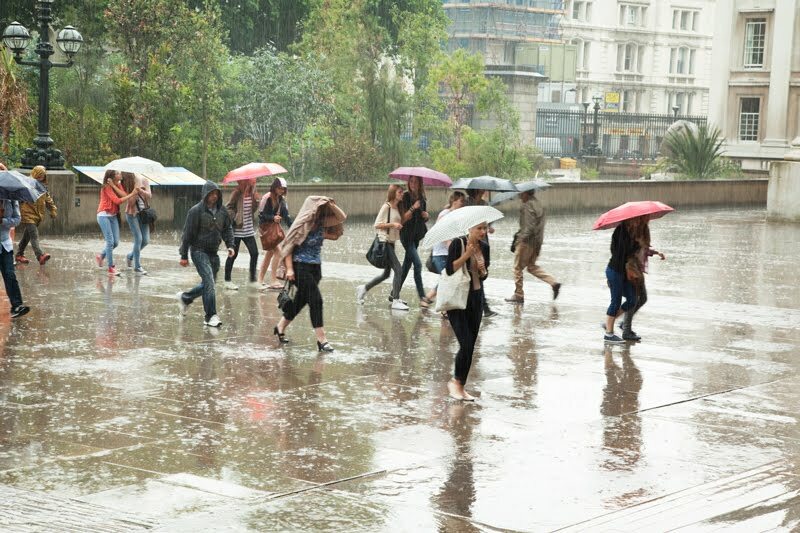 Great photo of the great British summer! Lovely movement captured!Its raining in Cape Town too - but chilly. It is a challenge not to get the camera wet! But also a challenge simply not to get everyone head-down-brolly-up! I get more paranoid about the camera than myself, but am hanging out for shots of overflowing gutters, for a bit of light relief. My son was at Shepherds Bush Empire yesterday. He did see X JAPAN, in Europe for the first time ever. Now he is back home again. I can relax. He said it was a very warm rain. This is a good image, Mo. Everyone has their umbrella up and they are all racing somewhere. Hey, this looks like Perth, West Oz!! always a pleasure to look at your blog - this one particularly refreshing! Well, it looks very much like Stavanger! I've found if I get an umbrella with a long handle, I can hug it to my body, tuck it under my elbow and thus use both hands.